Rooms - A Place in the Sun Garden Hotel one of the best hotel in Palm Springs. This cozy little bungalow next to the office has a living room with couch and easy chair and an electric fireplace that can be used any time of the year (the heat can be turned off for summer). The separate bedroom has a king bed. There’s a fully equipped kitchen, big bath with tub and shower, and small private walled patio with patio table and chairs. This is a big room with high open wood beam ceilings. It has a queen sleepnumber bed, which is the kind of bed where you can adjust the firmness/softness independently on each side of the bed with a remote control. It has Bahama beds, which are day beds in a corner arrangement but fully made up twin beds for sleeping, in the same room. It has an electric fireplace that can be used anytime of the year (the heat can be turned off for summer). There’s a separate fully equipped kitchen, like an apartment sized kitchen, and a private walled patio with perimeter landscaping and patio furniture and chaise loungers. French door entry to a room with queen bed, flat screen TV, and electric fireplace. New mini-split air conditioner/heater, ceiling fan, and large bathroom with shower, separate water closet, and original grey and pink tiles. This room can be combined with the Large One Bedroom Bungalow to make a Two Bedroom / Two Bath bungalow. Please call the hotel (760-325-0254) for this option. Living room has high open wood beam ceilings, natural gas fireplace, and tremendous views of the pool and gardens. Separate area off the living room has a queen sofa sleeper. Fully equipped kitchen, including dishwasher, has pass-through breakfast counter to the dining area. Separate bedroom has your choice of either two twin beds or one king (we have a great doubling system where we strap the beds together with a sheepskin down the middle, then put a pillow topper over that). 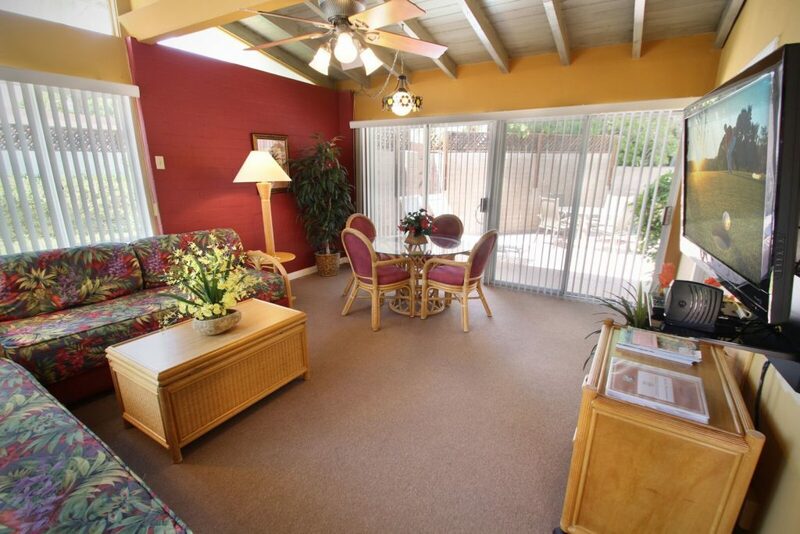 Private walled patio has table and chairs, and large patio lounge set. Ceiling fans in all rooms. 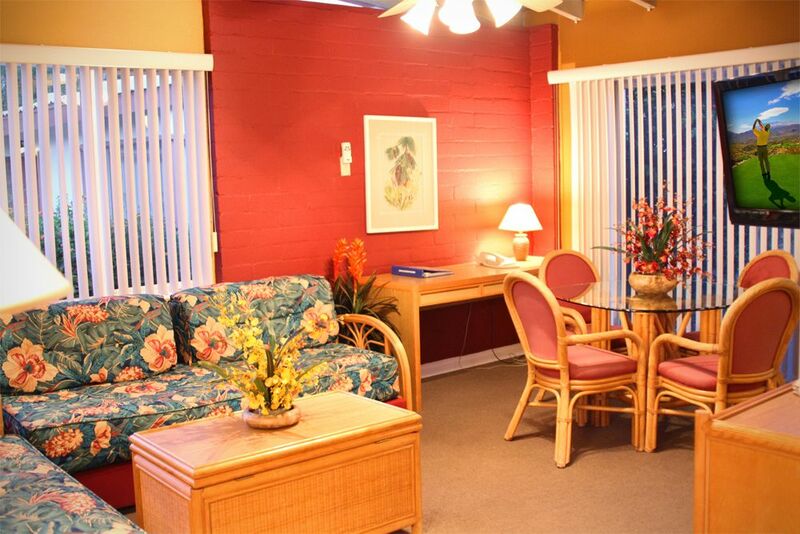 This room can be combined with the Small Studio to make a Two Bedroom / Two Bath bungalow. Please call the hotel (760-325-0254) for this option. This is a room with two twin beds or one king. (we have a great bed doubling system where we strap the beds together with a sheepskin down the middle, then put a “blissful bed” pillow topper over that). 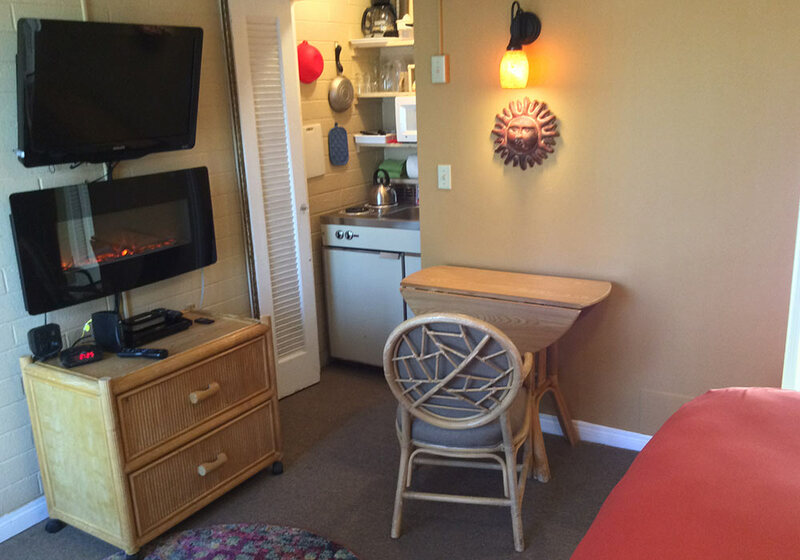 It has a fully equipped kitchenette, which is the “world’s smallest kitchen in a closet”, but it has everything you need – frig, couple burners, coffee pot, microwave, toaster, even coffee grinder and whole beans. There’s a flat screen t.v. with blueray/dvd player, and an electric fireplace that can be used anytime of the year (the heat can be turned off for summer). It has a bathroom with shower, and small private walled patio and patio table and chairs. This has a living room and separate bedroom with high open wood beam ceilings. The living has Bahama beds, which are day beds in a corner arrangement but fully made up twin beds for sleeping. The separate bedroom has a king bed. 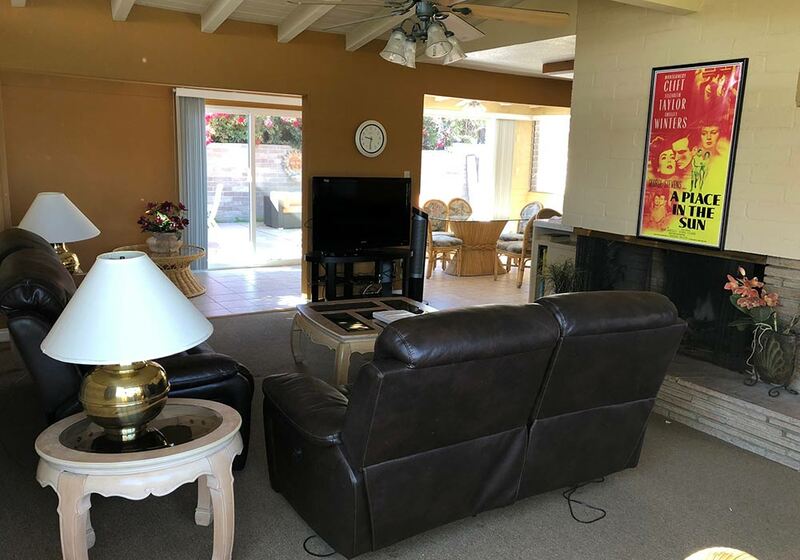 There’s a fully equipped kitchen, big bath with tub and shower, and large private garden patio that has half grass/half deck with patio furniture and chaise loungers. This has a living room and separate bedroom with high open wood beam ceilings. The living room has Bahama beds, which are day beds in a corner arrangement but fully made up twin beds for sleeping. The separate bedroom has a king bed. It has an electric fireplace that can be used anytime of the year (the heat can be turned off for summer). 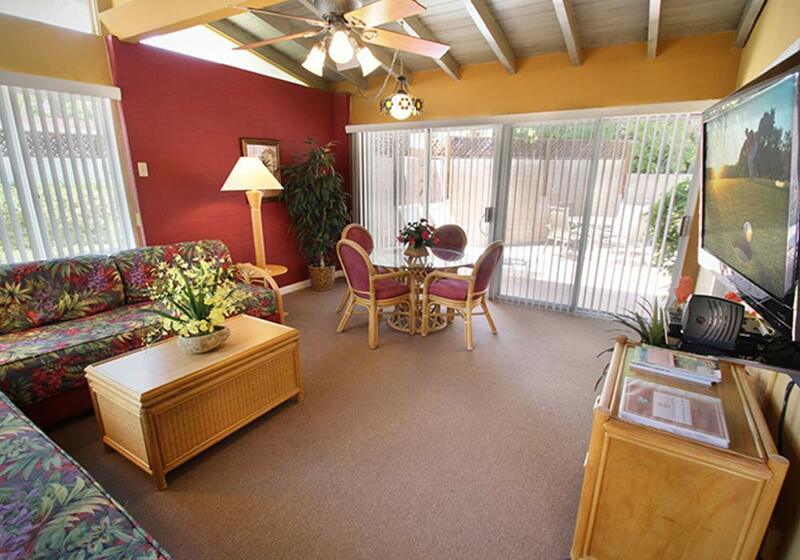 There’s a fully equipped kitchen, big bath with tub and shower, and small private walled patio with patio furniture. This has a living room and separate bedroom with high open wood beam ceilings. 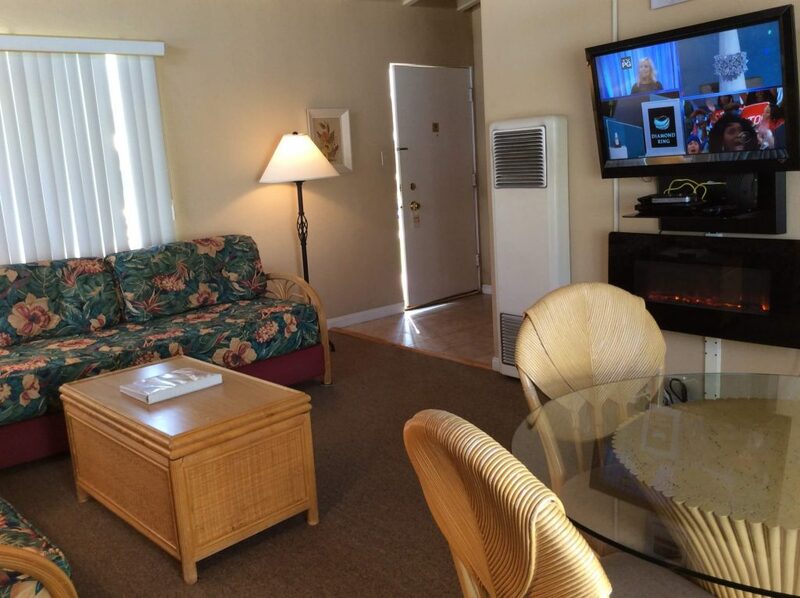 The living room has a three piece sectional queen sofa sleeper, and the separate bedroom has two double beds. There’s a fully equipped kitchen, big bath with tub and shower, and large private walled garden patio that has half grass/half deck with patio furniture and chaise loungers. It also has an electric fireplace that can be used anytime of the year (the heat can be turned off for summer). Living room and separate bedroom have high open wood beam ceilings. 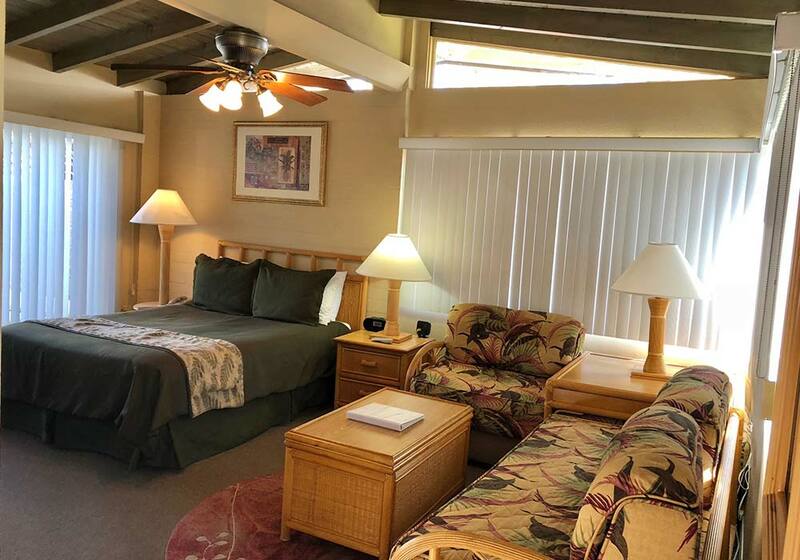 The living room has a flat screen TV, electric fireplace, dining table and four chairs, and Bahama beds, which are day beds in a corner arrangement, but fully made up twin beds for sleeping. Separate bedroom has a king bed* (*some units have Sleep Number beds - if this is of interest to you, please call the hotel at 760-325-0254). 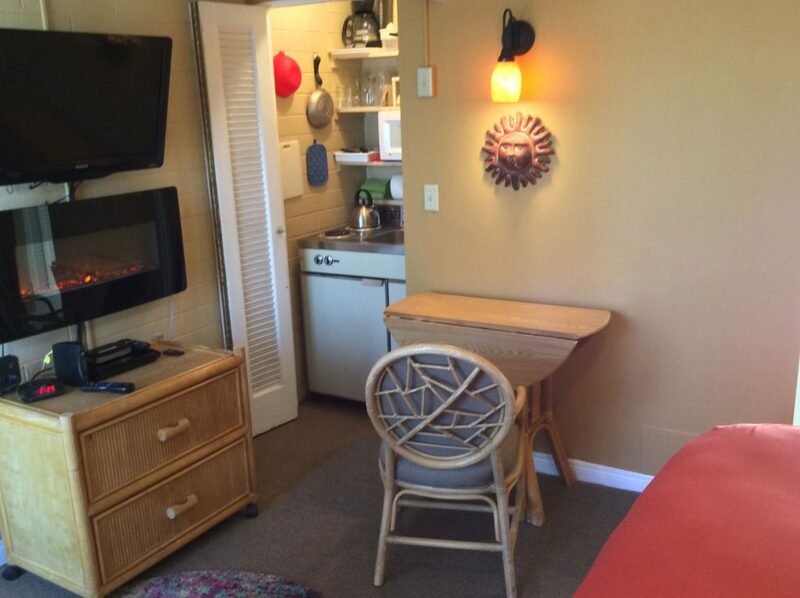 There is a fully equipped kitchen, including coffee pot and ground coffee, but also coffee grinder and beans. The bathroom has a tub/shower combination, and there is a large private walled garden patio that has half grass/half deck with patio furniture. 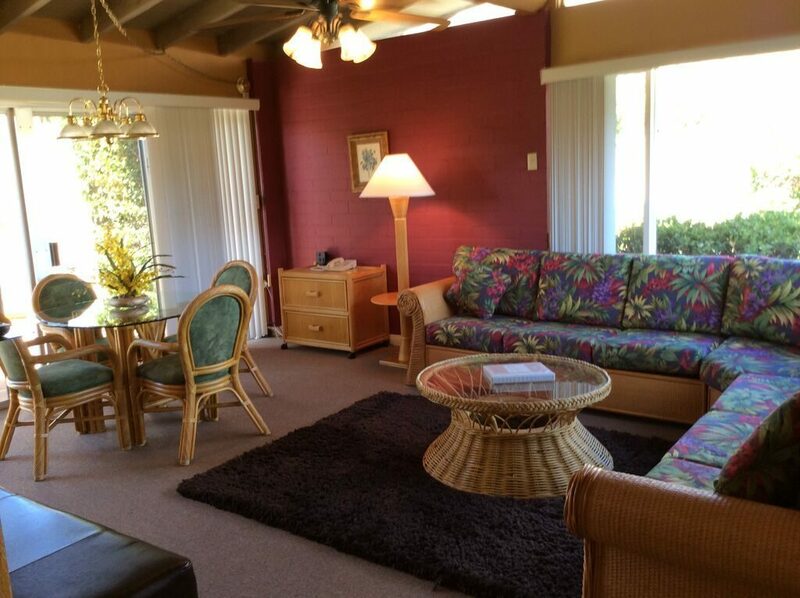 This has a living room and separate bedroom with high open wood beam ceilings. 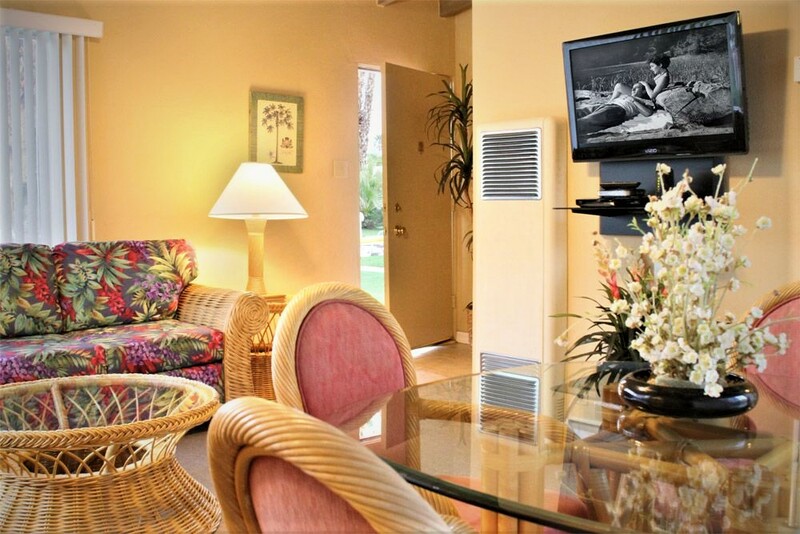 The living room has two Bahama beds, which are day beds in a corner arrangement, but fully made up twin beds for sleeping, and an electric fireplace that can be used anytime of the year (the heat can be turned off for summer). The separate bedroom has two double beds. There’s a fully equipped kitchen, big bath with tub and shower, and large private walled garden patio that has half grass/half deck with patio furniture and chaise loungers.